As the elite racers came into the final run-up of the final lap of the final race of the Cross Crusade, I could hear the excitement in the crowd build. But, I couldn’t see what was happening…yet. A fantastic race with several lead changes came down to the final hundred feet. In the series standings, Molly Cameron led Sean Babcock by just one point. This race would decide the series champ. So when they appeared at the top of the run-up inches apart, it seemed we were in for a muddy sprint. Babcock jumped on his bike and took off. Molly’s bike took a funny bounce as it hit the ground, she slipped and crumbled into the mud. The crowd let out a groan and then shouts of encouragement. But the race was over…and so was Cross Crusade 2009. You can see more images from this race and the rest of the season at pdxcross. This entry was posted on Monday, November 16th, 2009 at 3:04 pm. 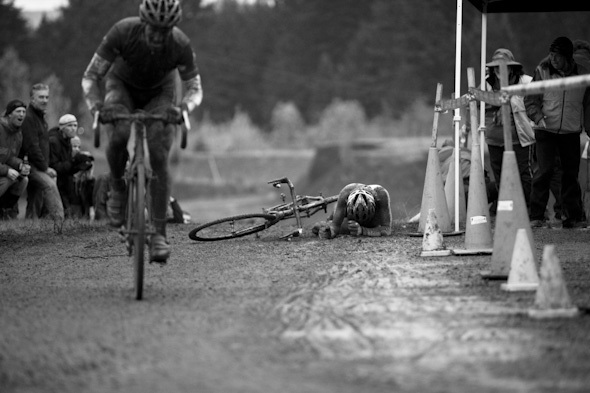 It is filed under cycling, sports, the northwest and tagged with barton, cross crusade, cyclocross, photography, photojournalist, portland, tim labarge. You can follow any responses to this entry through the RSS 2.0 feed.